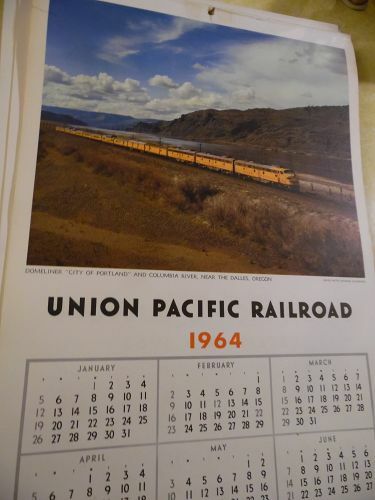 Vintage, late 1950's, 12 3/4" X 10 1/4" UNION PACIFIC RAILROAD COLOR ART PRINT. A print on each side. One with the train and on the other side a view of the inside of one of Union Pacific's trains. 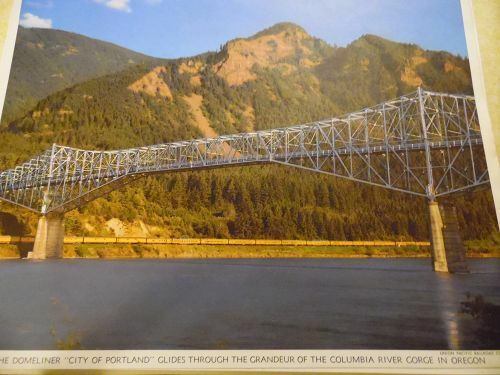 This one titled "The Domeliner City of Portland glides through the grandeur of the Colombia River gorge, Oregon". On the flip side" The Stately Temple in Salt Lake City Utah is the Chief Sanctuary of the Mormon Church" Excellent condition and ready to frame. 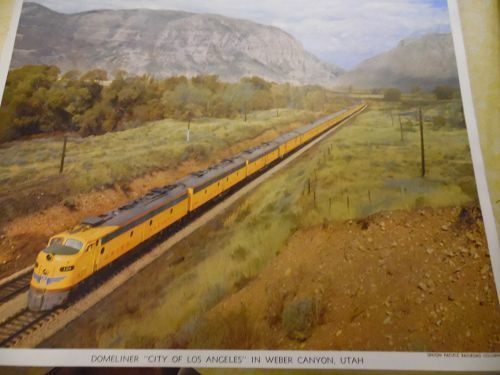 Vintage, late 1950's, 12 3/4" X 10 1/4" UNION PACIFIC RAILROAD COLOR ART PRINT. A print on each side. One with the train and on the other side a view of the inside of one of Union Pacific's trains. 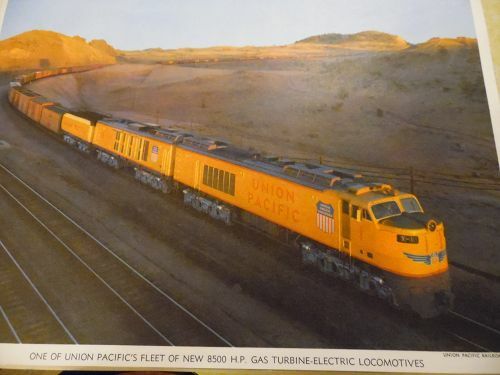 This one titled "One of union Pacific'x fleet of new 8500 HP Gas Turbine-Electric Locomotives". On the flip side "Palm Trees, Citris Groves and Mountains California Seasons Greetings" Excellent condition and ready to frame. 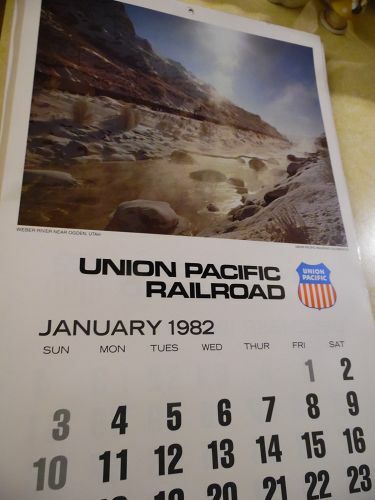 Vintage, late 1950's, 12 3/4" X 10 1/4" UNION PACIFIC RAILROAD COLOR ART PRINT. A print on each side. One with the train and on the other side a view of the inside of one of Union Pacific's trains. 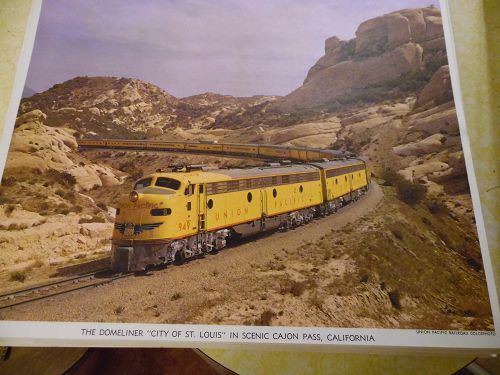 This one titled "The Domeliner City of St.Louis in scenic Cajon Pass,California". On the flip side " A Christmas card viw of Challenger Inn Sun Valley Idaho " Excellent condition and ready to frame. 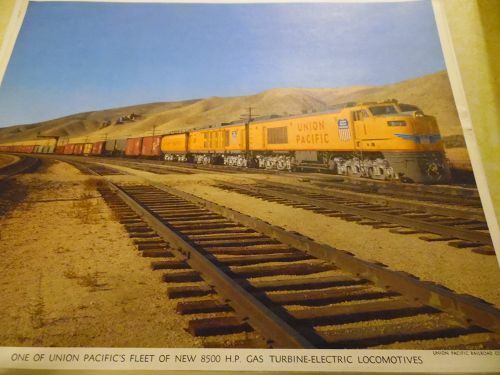 Vintage, late 1950's, 12 3/4" X 10 1/4" UNION PACIFIC RAILROAD COLOR ART PRINT. A print on each side. One with the train and on the other side a view of the inside of one of Union Pacific's trains. This one titled "The Domeliner City of Los Angeles pauses at the East los Angeles Station". On the flip side Los Angeles City Hall and Federal Building as seen from Patio of Los Angeles Union Passenger Terminal" Excellent condition and ready to frame. 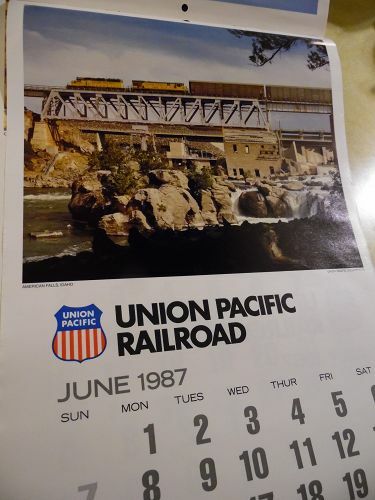 Vintage, late 1950's, 12 3/4" X 10 1/4" UNION PACIFIC RAILROAD COLOR ART PRINT. A print on each side. One with the train and on the other side a view of the inside of one of Union Pacific's trains. 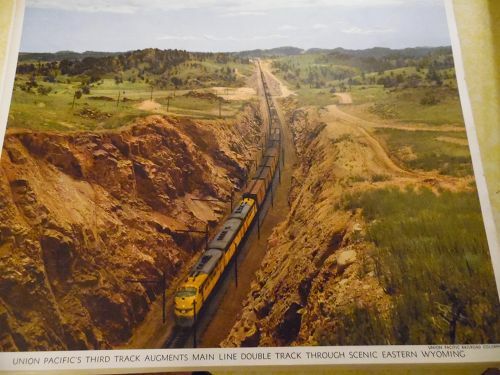 This one titled "Union Pacific's Third Track Augments Main Line Double Track Through Scenic Eastern Wyoming". 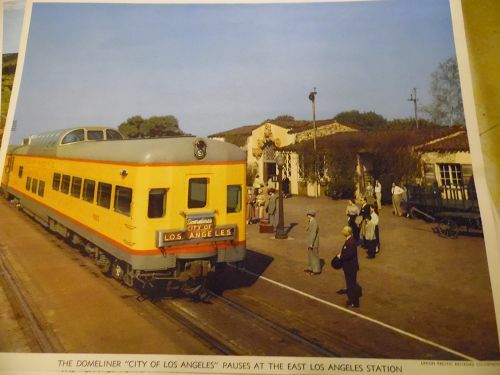 On the flip side The Only Dome Dining Cars In The World are on Domeliners, City of Los Angeles, and City of Portland" Excellent condition and ready to frame. I have 2 ,price is per print. 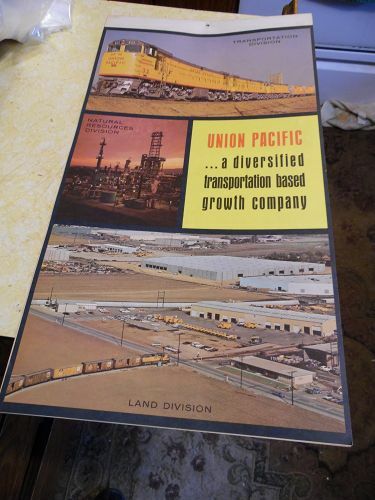 Vintage, late 1950's, 12 3/4" X 10 1/4" UNION PACIFIC RAILROAD COLOR ART PRINT. A print on each side. One with the train and on the other side a view of the inside of one of Union Pacific's trains. 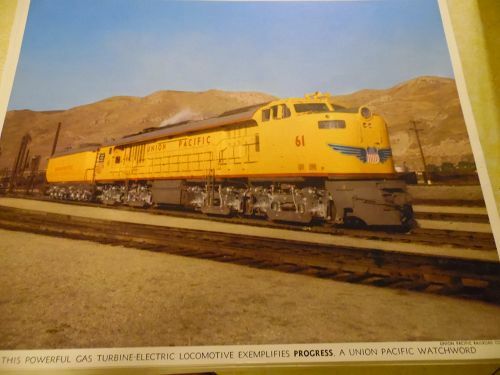 This one titled "This Powerful Gas Turbine-Electric Locomotive Exemplifies PROGRESS, a Union Pacific Watchword. On the flip side "The smartly luxurious main dining room of an Astra Dome Dining Car" Excellent condition and ready to frame. 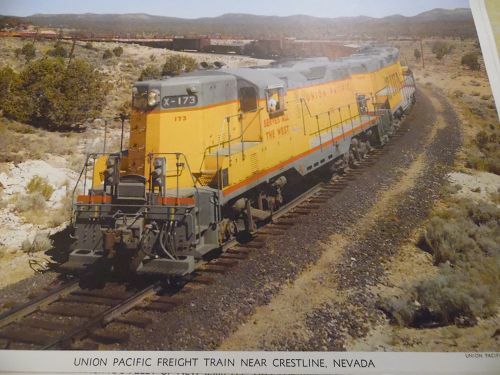 Vintage, late 1950's, 12 3/4" X 10 1/4" UNION PACIFIC RAILROAD COLOR ART PRINT. A print on each side. One with the train and on the other side a view of the inside of one of Union Pacific's trains. 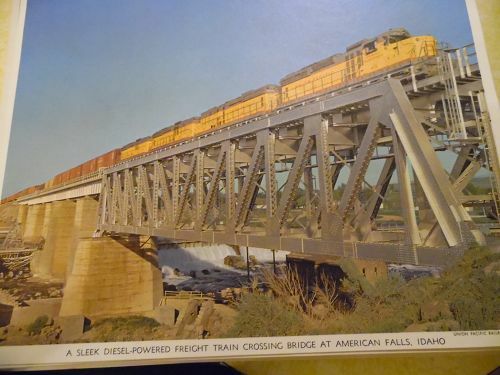 This one titled "A Sleek Diesel-powered freight train crossing bridge at American Falls, Idaho". On the flip side "Part of luxurious main lounge in Union Pacific Dome Lounge" Excellent condition and ready to frame. 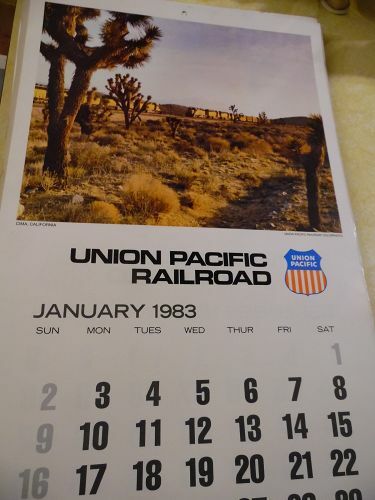 Vintage, late 1950's, 12 3/4" X 10 1/4" UNION PACIFIC RAILROAD COLOR ART PRINT. A print on each side. One with the train and on the other side a view of the inside of one of Union Pacific's trains. 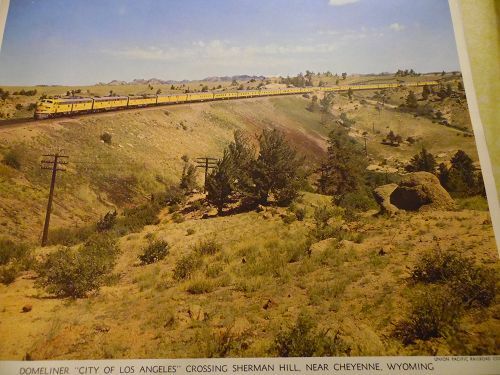 This one titled "Domeliner"City of Los Angeles" crossing Sherman Hill Near Cheyenne Wyoming". On the flip side "Congress Plaza and Michigan Avenue Chicago" Excellent condition and ready to frame. Vintage, late 1950's, 12 3/4" X 10 1/4" UNION PACIFIC RAILROAD COLOR ART PRINT. A print on each side. One with the train and on the other side a view of the inside of one of Union Pacific's trains. 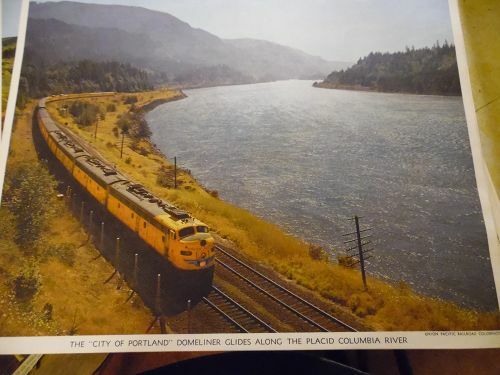 This one titled "Domeliner"City of Portland" glides through the grandeur of the Colombia River Gorge in Oregon" . On the flip side "The Meeting Place for skiers from all over the world is Sun Valley Idaho" Excellent condition and ready to frame. Vintage, late 1950's, 12 3/4" X 10 1/4" UNION PACIFIC RAILROAD COLOR ART PRINT. A print on each side. One with the train and on the other side a view of the inside of one of Union Pacific's trains. 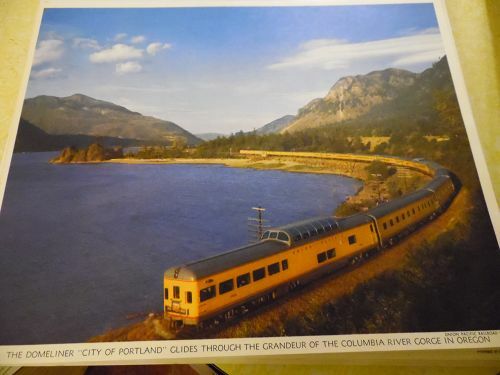 This one titled "Union Pacific Freight Train Near Crestline Nevada" on the flip side "Colombia River Gorge from Dome dining room, Domeliner "City of Portland" Excellent condition and ready to frame.